Here too, the design is really impressive. The dashboard looks contemporary, as does the chunky three-spoke steering wheel. There’s a nice, glossy black, chrome-lined central console that looks good too, and the instrument cluster uses a large, sporty digital speedo; there’s no tachometer though. On the storage front, you get a pair of big door bins at the front to hold bottles, two glove boxes and a large recess between them. There are cupholders and a cubbyhole between the seats, but they feel a tad too shallow for all practical purposes. The AC vents also have chrome accents and can, rather neatly, be clicked shut, but they do feel a touch flimsy. And like with the exterior, you will start to see a few cost-cutting signs if you look hard enough, but they’re really no better or worse than other cars in this class. Things like exposed screws, centre-mounted window switches at the front, no power windows at the rear, and non retracting seatbelts at the back either – you have to adjust the length manually every time you buckle up. A lot of this is par for the segment, but since the Kwid looks so upmarket, you have to remind yourself about which segment it is in. On that note, it’s interesting to see the way Renault has chosen the equipment here. It’s a budget car, so you don’t expect a lot, so things like the big multifunction touchscreen, digital instrument cluster, Bluetooth, fog lamps, the optional airbag and navigation are incredible features for a car at this price. Renault has been clever to give customers desirable features like this, while saving costs in areas less consequential to the average budget car buyer. It’s a smooth engine with a sprightly low and mid end but suffers from lack of power high up the rev band. You can short shift and stay in a higher gear without losing much speed. It’s not going to be a blast down the highway but the Kwid is quick on its feet nonetheless. The 5-speed manual gearbox is easy to use and the ratios are spaced well for city use. You don’t feel the vibrations in the gear lever that’s an annoying feature in the Alto. The pedals however could do with a bit more play, both the clutch and the brake. There are obvious hints in the Kwid which show Renault recognises that part of the strategy in this segment is playing a mind-game. But, we wonder if the choice of a 800cc engine was also one that was influenced by this market reality. But eitherways, with the “Kitna Deti Hai?” question being a constant, it is good to note that the Kwid’s 799cc petrol engine is the most frugal in the segment. This three-cylinder engine is not as refined as the one’s in cars one segment above, but when compared to the Alto 800 or the Hyundai Eon, it is about very similar in idling character. Cabin noise levels are fairly well contained, though we felt vibration levels could have been lower. The test mule we drove was a pre-production model; hopefully the final versions will be better insulated. The engine itself is a fairly peppy unit, for its size. Generating 54PS of peak power, and 74Nm of torque, the engine delivers much of this at lower rpm levels, though the peaks are hit closer to 5,000rpm. But, its ability to respond quickly to driver inputs seems to be affected by the throttle mapping. Overall, the focus seems to have been to squeeze the most fuel efficiency from the powertrain. Speaking of which, the engine is paired to a 5-speed gearbox. Shift quality is good and there is none of the rubbery feel that some of the other cars in the segment have. 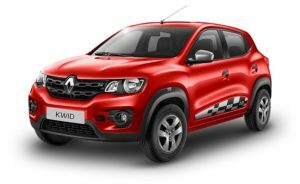 The are multiple reasons to state that Kwid is a strong product from Renault as firstly, it is a global car made from scratch and not a mere downsized or upgraded variant of any other car. The CMF-A platform, which powers the Kwid, has been designed and tuned to take care of all the present and upcoming needs and requirements. The same platform has potential to churn out cars with varied body types.